As one of the nation’s largest charities, United Way understands the impact that charitable giving has on improving communities and helping individuals. United Way also understands how important it is to choose the right organization to donate your hard-earned dollars. As you prepare to make any type of charitable gift, we urge you to follow the simple guidelines below. 1. View Your Donation as an Investment. Any gift to a charity should be seen as an investment, and you want to invest in a charity that will make a major impact on its recipients while also giving you personal satisfaction. An investment approach to a particular group or cause will ensure a more meaningful experience for you. 3. Understand the Tax Benefits of Giving. An added benefit to giving is that most charitable donations are tax-deductible. To receive a tax deduction, you will need the proper documentation when filing your income tax returns. The IRS requires a receipt for each tax-deductible contribution of $250 or more. Depending on the amount or type of your gift, you may need to provide additional documents with your tax form, such as Form 8283 for each non-cash donation exceeding $500. 4. Decide How You Will Give and How Much. Financial donations are the most popular charitable gifts, but there are other ways to help your favorite cause. Many organizations will accept property and goods, as well as your time. There are many options on how to give, including donating directly online, by mail, through your workplace & payroll deduction or through a donor-advised fund. Additionally, find out if your employer will match your charitable gift. This will even further maximize your investment. Once you have made your gift, mark your calendar with important dates of your charity’s meetings and key events for the year. These are excellent ways to see your investment at work. Also, be sure to track the dates and amounts you gave payment methods and desired uses for your gift. You should automatically receive a receipt with an acknowledgement of your gift. If you don’t, be sure to follow up. Don’t rely on a cancelled check to count as a receipt. United Way of Hernando County believes it is important for the community to know that investments remain LOCAL here at home in Hernando County. As UWHC's Board of Directors and Staff like to say, "You LIVE here, you GIVE here, it STAYS here!" Did You Know that all United Ways are independent? According to United Way of Hernando County's most current 990, UWHC Administrative Costs are 7.9%. United Way of Hernando County does not provide Community Investment Grant funds for any organization with an admin higher than 25%. YOU LIVE HERE... YOU GIVE HERE... IT STAYS HERE! please add detailed information under "PURPOSE: Add special instructions for United Way". See how your donation creates an impact around the clock! View past Annual Reports to see exactly what programs your contribution supported! How can I give back to my community through volunteerism? 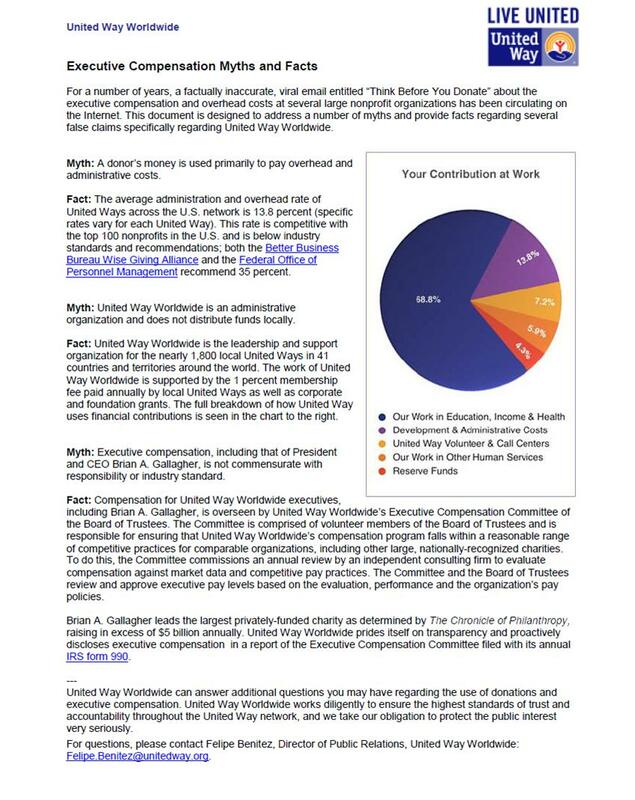 Please view the common 'Myths & Facts' below from United Way Worldwide. All percentages and pie chart are based off of United Way Worldwide figures, which do not touch United Way of Hernando County local dollars. Less than .93% is spent on United Way Worldwide Membership.